TORONTO, ONTARIO--(Marketwire - Oct. 14, 2010) - Vena Resources Inc. (TSX:VEM)(LIMA:VEM)(FRANKFURT:V1R)(OTCBB:VNARF), a Company with strong partnerships with some of the world's largest mining companies, is pleased to announce that Henkle and Associates ("Henkle") has completed its first resource estimate for Minergia S.A.C., a uranium exploration company owned by Vena (75%) and Cameco (25%). Henkle's NI 43-101 compliant report will be published within 45 days and will also include initial resource estimates for other areas that Minergia controls on the Macusani Plateau in Peru. 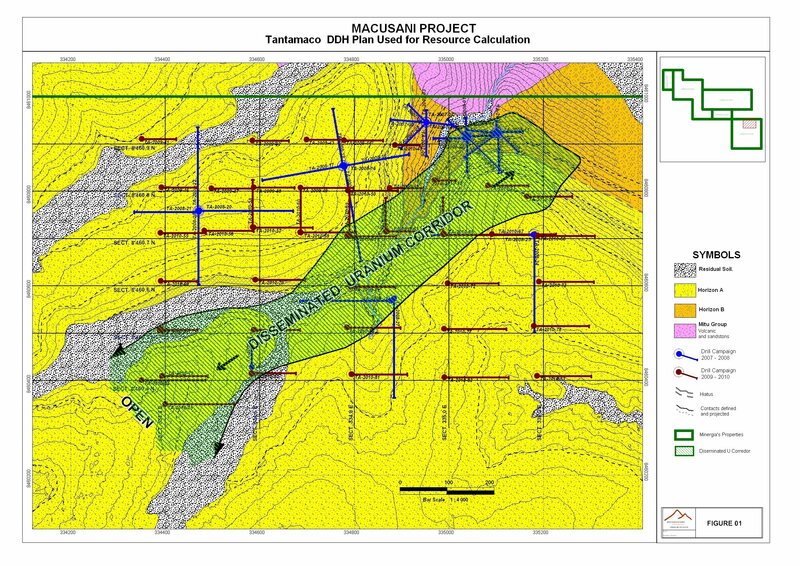 "We are pleased to report a first-stage resource estimate for Tantamaco, one of five projects being drilled jointly with Cameco in the Macusani area of Puno, Peru. Given the success of the current drilling campaign, Minergia is already planning the next phase drill program and is currently in the process of obtaining drilling permits with the goal of expanding and improving the resource base." The Tantamaco resource was calculated using the Polygon Area method of resource calculation as follows. The mid points of mineralized intersections from the 86 angle drill holes were used as centre points of the polygons. A 150 metre search radius was used to search for "nearest neighbour" mid points. The area of each polygon was calculated and then multiplied by the true thickness of the mineralized intercept to obtain a volume. The volume was then multiplied by the density of the mineralized rock which in this case is 1.98, to obtain a tonnage value. The tonnage was then multiplied by the tenor of the mineralization (lb of U3O8 per tonne) to obtain the number of pounds of U3O8 contained within each polygon. The results for each individual polygon were then summed to arrive at the estimate for the project area. The varying areas of the 86 separate polygons were then plotted on a straight line graph from smallest to largest, being a range of 756 m2 to 67,247 m2. The graph showed three distinct populations, breaking at 18,000 m2 and 40,000 m2. Polygons with areas less than 18,000 m2 were assigned to the Indicated Resource category. Polygons with areas between 18,000 m2 and 40,000 m2 were assigned to the Inferred Resource category. Polygons with areas greater than 40,000 m2 were assigned to the Hypothetical Resource category and were not reported in compliance with NI 43-101 guidelines. Uranium mineralization at Tantamaco occurs in the upper (Yapamayo) unit of the approximately 600 metre thick Quenamari rhyolitic pyroclastic formation of Mio-Pliocene age. At property scale, the Yapamayo is divided into two units – the A and B horizons which are separated by an erosional surface that is marked as a distinct hiatus in the volcanic cycle. Uranium mineralization in the A horizon is referred to as the Upper Zone and is generally quite thin and erratic at Tantamaco. The B horizon hosts the Lower Zone which constitutes the bulk of the uranium resources delineated to date. The maximum depth to the base of the Lower Zone mineralization is 150 metres below surface. Uranium at Tantamaco is predominantly contained in autunite (U phosphate) with lesser weeksite (U silicate) that was precipitated at a relatively low temperature (100â° C). The mineralization occurs as both fracture-fillings and as fine disseminations within the tuff. The working hypothesis is that the major controls for the mineralization are structural and hydrogeological. Vena and Cameco's drilling program has delineated a structural corridor paralleling the small, central gully striking northeast – southwest that is dominantly a higher grade, uniformly disseminated mineralization (Fig 1). The zone is open to the southwest and there is a marked increase in grade in this direction which will be a major focus of the next drilling campaign. "The intensely disseminated style of uranium mineralization discovered in the Lower Zone at Tantamaco greatly enhances the prospectivity of the Quenamari volcanics to host economic uranium deposits. Tantamaco will serve as a model in our search for the large deposits that may be completely hidden or have only minimal exposure at surface." This report was prepared by William R. Henkle, Jr., P.Geo., Vena's Qualified Person as defined by NI 43-101. Vena Resources Inc. is a Canadian mining company focused on the exploration and development of Peru's mineral potential. Employing a model of diversification across metals and regions in Peru to mitigate investment risk, the Company has four divisions: Mining, Clean Energy, Precious Metals and Base Metals. Together with the Company's strategic partners, Cameco, Gold Fields and Trafigura, Vena will advance its significant portfolio of almost 80,000 hectares this year. Through its board of directors and advisors, Vena possesses a unique quality of skills and experience in management, mining and finance globally.